Back in March, Huawei announced it was strengthening its wearables game with a stunning looking smartwatch. 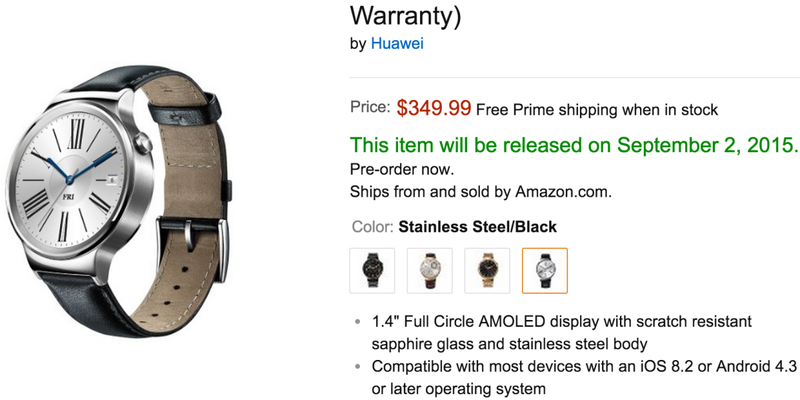 After months of waiting, the round-faced Android Wear device is finally available for pre-order on Amazon, but the pre-order page may have just revealed a special surprise. In other words, Android Wear may soon be compatible with your iPhone. It’s possible that this is just a mistake in the listing, but it’s hard to imagine a scenario where someone would mistakenly type both operating systems together on a listing for an Android Wear device. Another possibility would be that Huawei is creating proprietary software to allow its device to connect with iOS smartphones, but that would be unprecedented in an Android Wear watch. We’re reaching out to Huawei for comment, and will update this post if we hear back. If you’re interested in pre-ordering the device, prices start at $350 and climb up to $799 for the gold-plated editions. It looks like we’ll learn more at the IFA trade show in Berlin next week. Google is rumored to be preparing to push Android Wear more heavily, so it’s possible we’ll hear an official iOS support announcement then.